It's been over a week since I've made macs and I'm going through withdrawal. 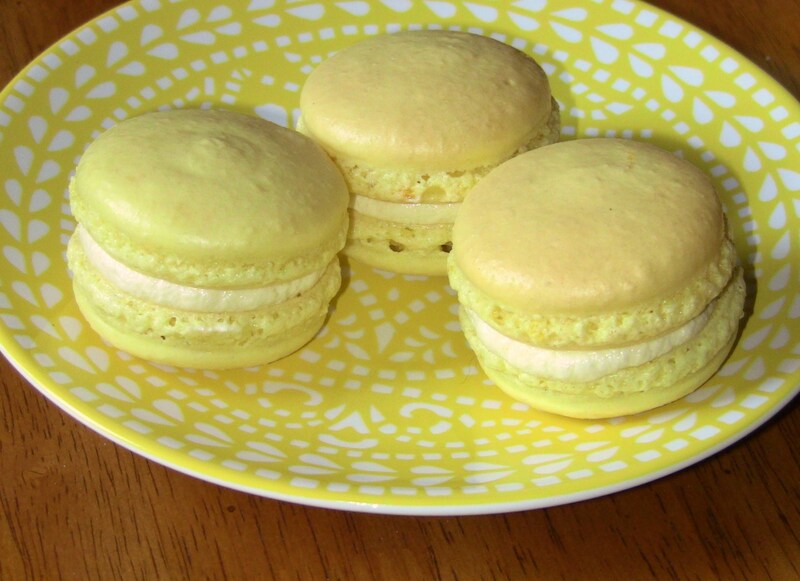 I thought I'd brighten things up with some zesty lemon macarons, sandwiched with a lemon cream filling. I'm still playing around with my mac recipes, the proportions of ingredients, the temp, the sizes, the baking times, the aging of the egg whites. Some days none of those things seem to matter and some days they all do. Aaaaargh! Alas, this is why I love these challenging darlings! Combine almond flour, powdered sugar and salt in bowl of food processor and pulse to blend. Sift and place in a big bowl. Place egg whites in mixer bowl with cream of tartar and begin whipping to soft peaks. Meanwhile, place sugar (along with about 2 oz water), zest and food coloring in a small saucepan and heat over medium-high until the syrup reaches the soft-ball stage (approximately 235°F). Immediately pour sugar syrup over beating egg whites and turn up the speed to high. Continue whipping until just warm. Place the meringue in the middle of the bowl containing the dry ingredients and stir to combine. Use long “J folds” to get all of the remaining dry ingredients incorporated. Pipe using a decorating bag onto a parchment-lined baking sheet. Rest up to 30-60 minutes to allow macaron shells to form a skin. Bake in 325°F oven for about 13-16 minutes depending on size. (Once the feet have formed around 6 minutes, open the oven to allow steam to escape, rotate pans at this time.) Sandwich cookies with lemon cream when cool. Combine 1 egg, 1 yolk and ½ cup sugar and whip until doubled in volume. 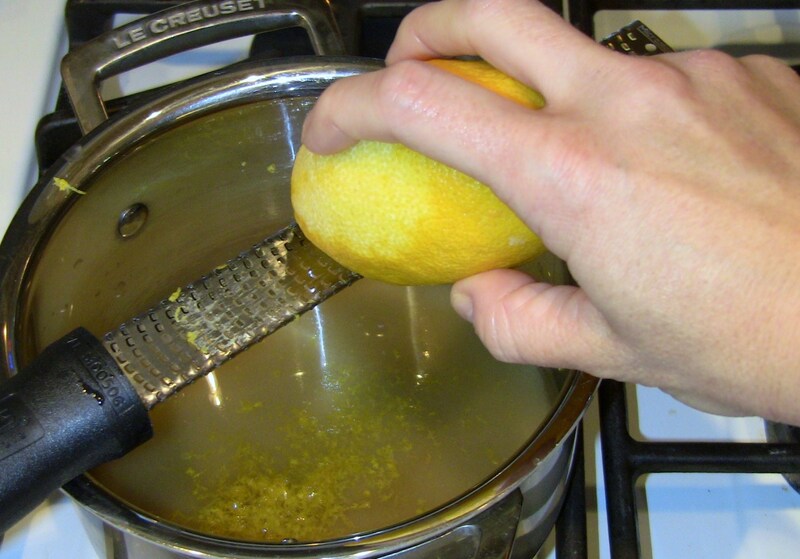 Scrape into a small saucepan; add 2 oz lemon juice and the zest from one lemon. Cook over medium until the mixture thickens. Scrape into a small bowl, cover the surface with plastic wrap and refrigerate until cool. Whip 1 stick butter until softened, then add lemon cream custard, whisk until homogeneous.